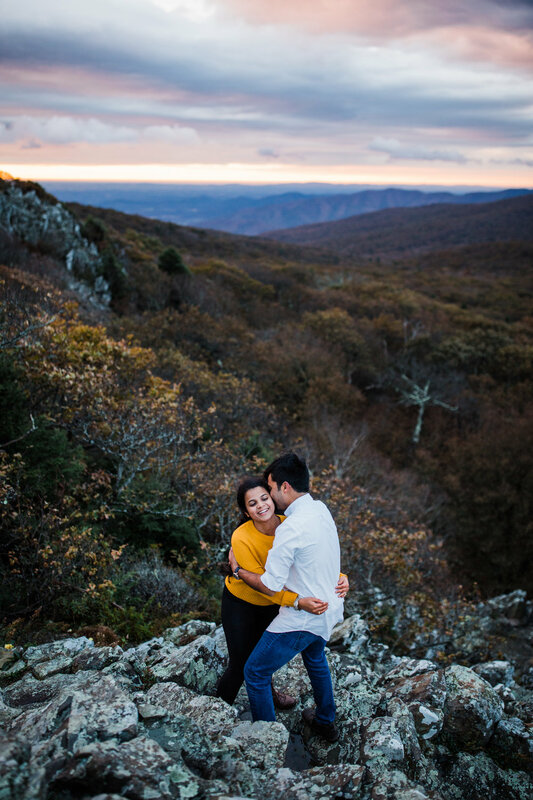 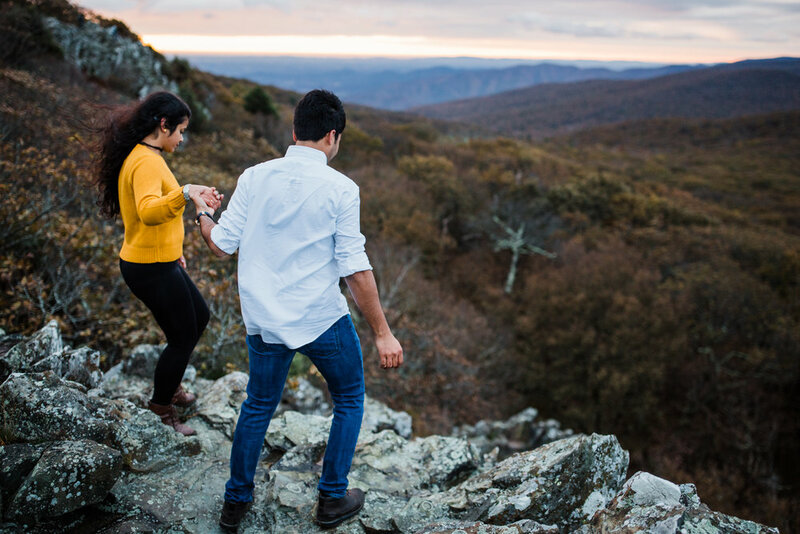 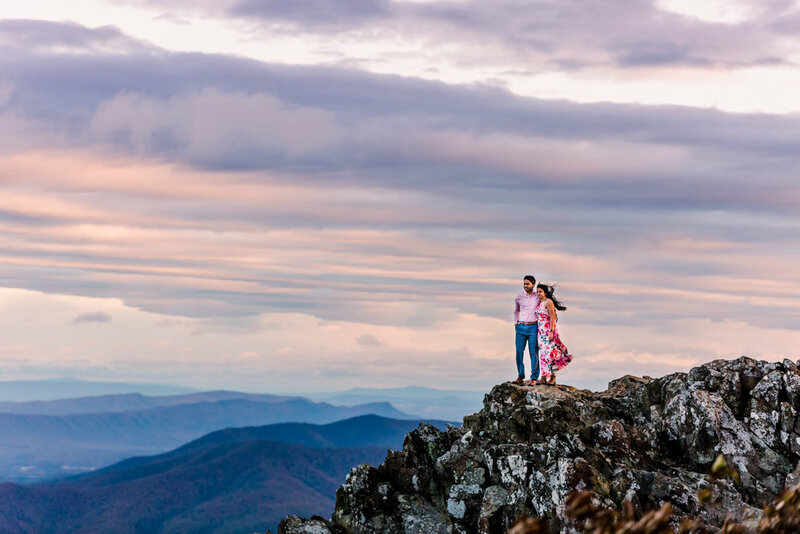 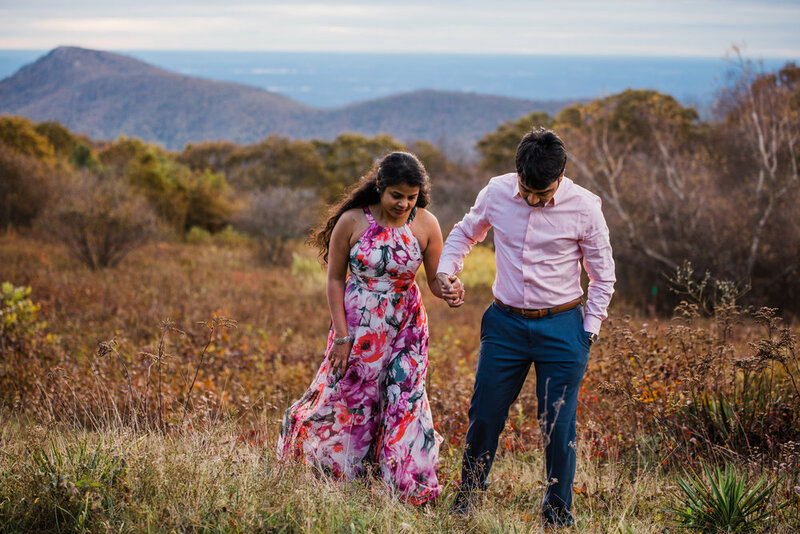 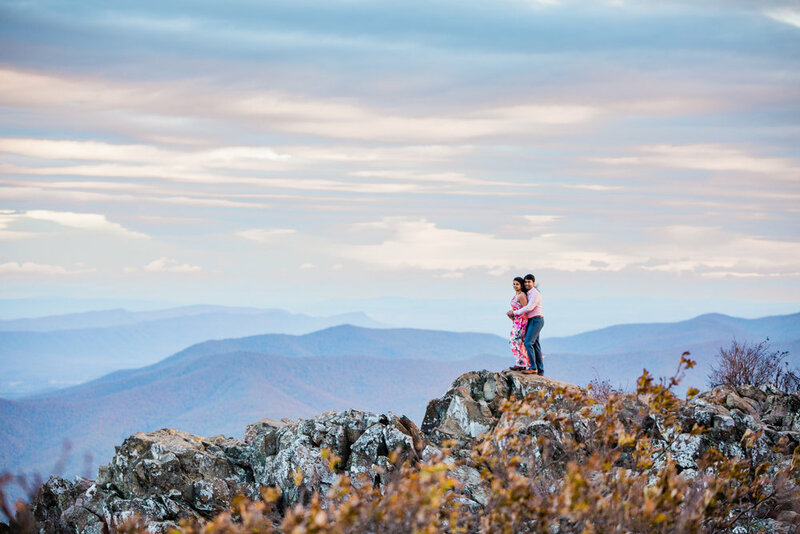 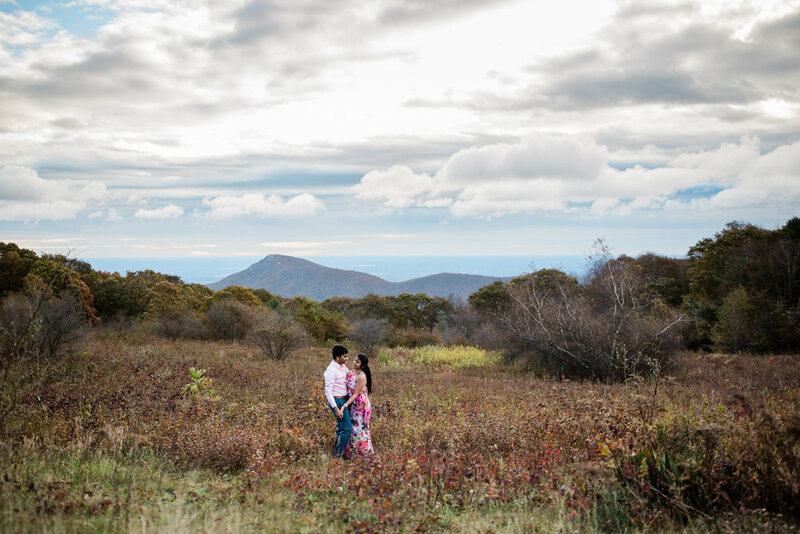 For whatever reason, my surprise proposals in Shenandoah National Park have always been sunrise sessions and have always been bitterly, freezing cold and very, very windy. 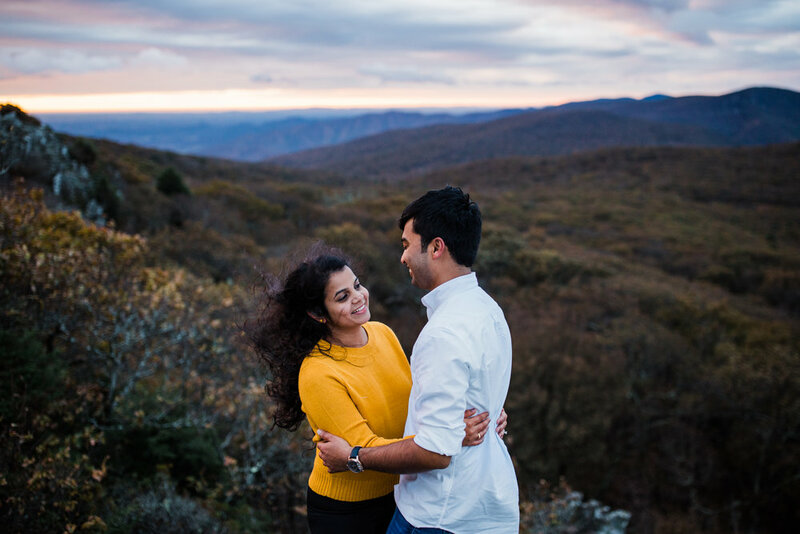 The day before our session, I drove down Skyline Drive, scouting possible locations for their after-proposal engagement session. 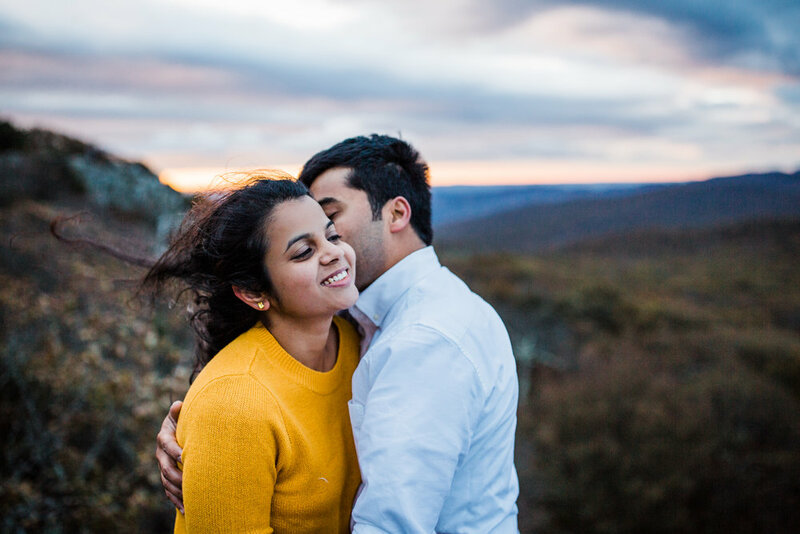 As it can be up on the mountain, it was so foggy that the pull-offs were almost completely shrouded. 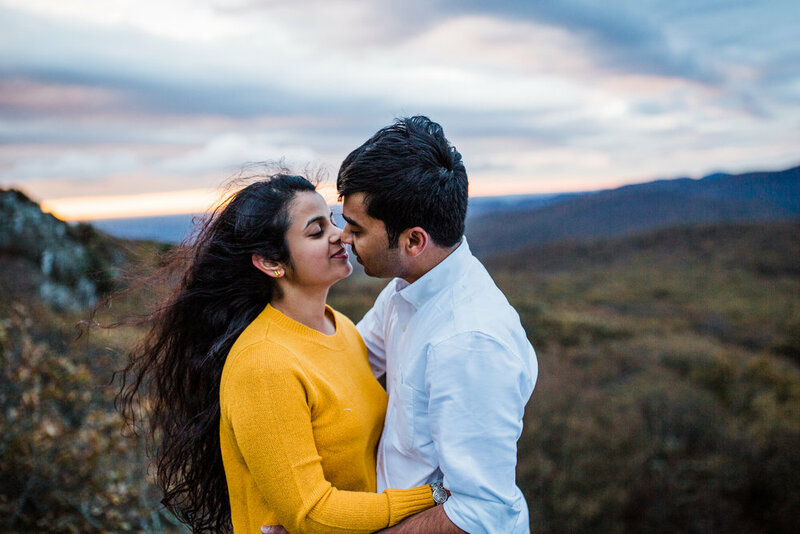 Mornings in the park tend to be particularly foggy so when I got back to my computer, I emailed Ramesh a warning that we might not have the beautiful mountain sunrise he was hoping for, but that foggy sessions can be just as beautiful. 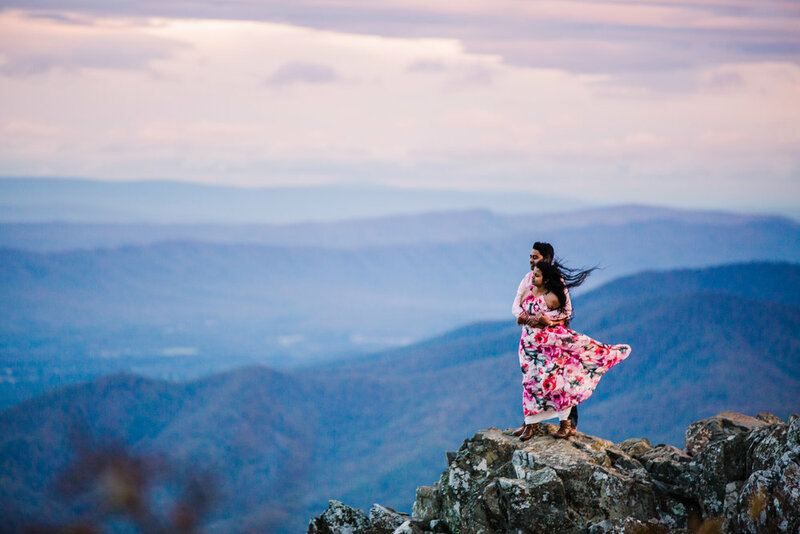 Of course, Shenandoah does her own thing and the morning of the proposal was crisp and totally, completely clear. 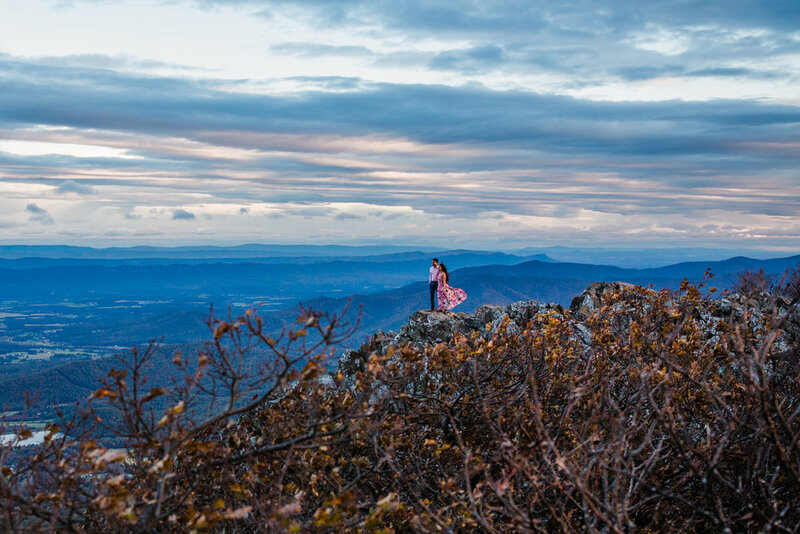 I got up on the mountain early to prep. 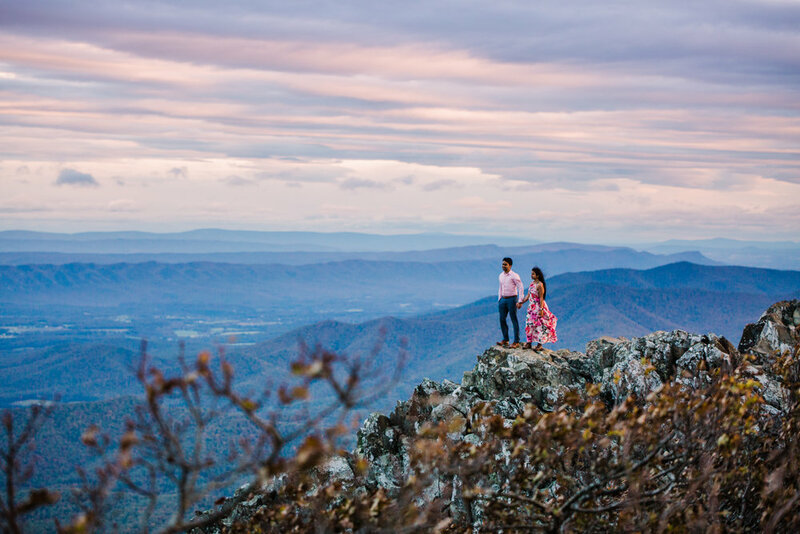 I’ve shot at this particular spot before, but it does require a little bit of a hike to get there so I wanted to make sure I was all set up. 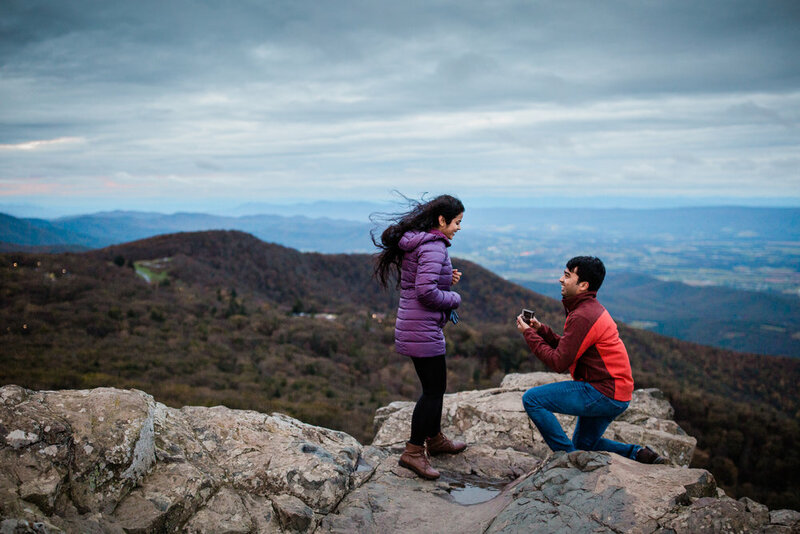 Sure enough, about 10 minutes later, a couple showed up. 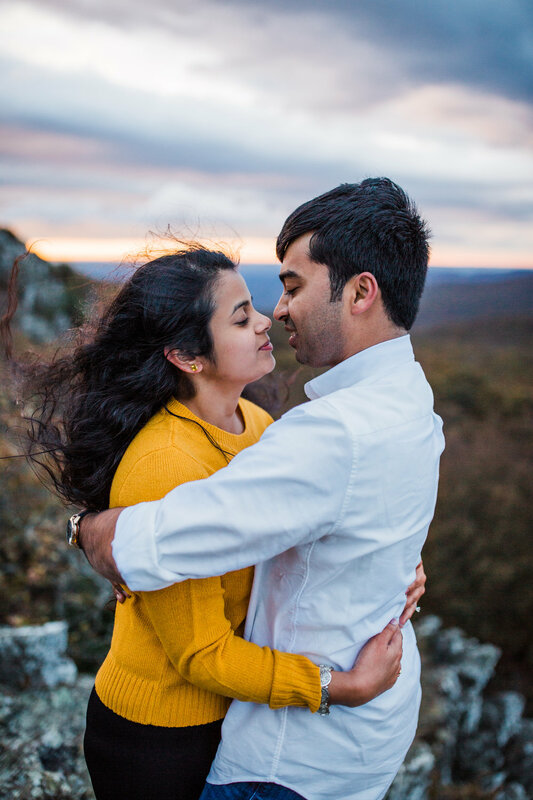 The thing is, I knew Ramesh was Indian from talking to him on the phone, and this couple didn’t look Indian, although they kind of had their faces covered with scarves. 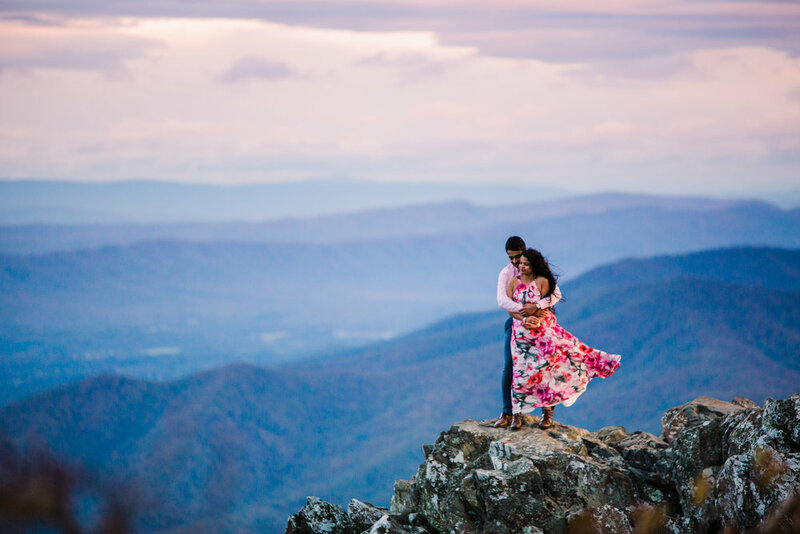 So, to test, I gave the guy my prompt. 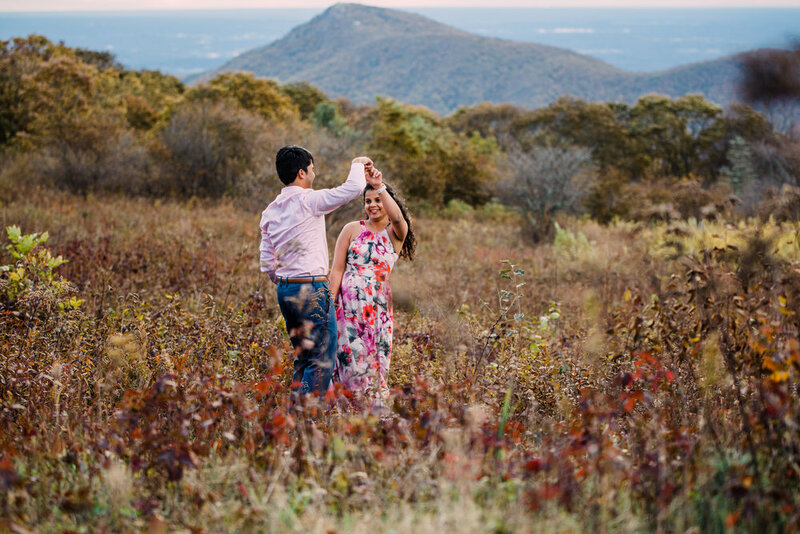 “Would you mind taking a picture of me? 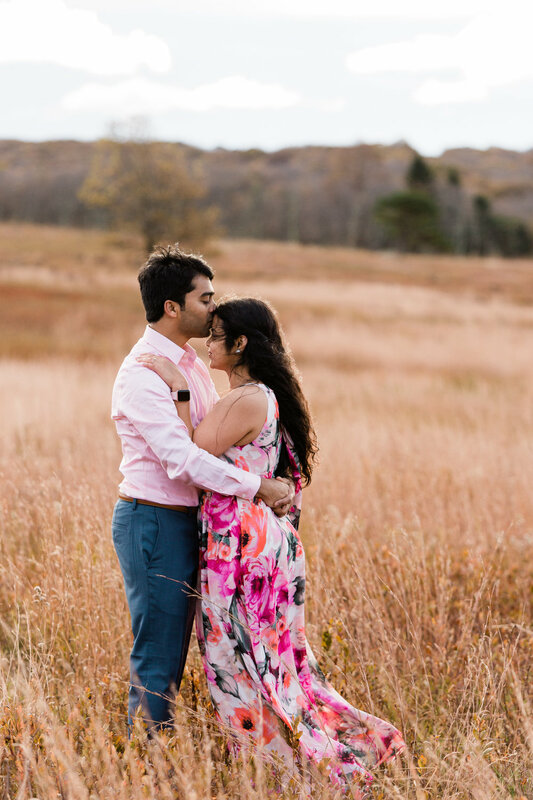 It’s so windy I think my tripod might get blown over.” As soon as he said sure and pulled down his mask, I knew they weren’t the right couple. 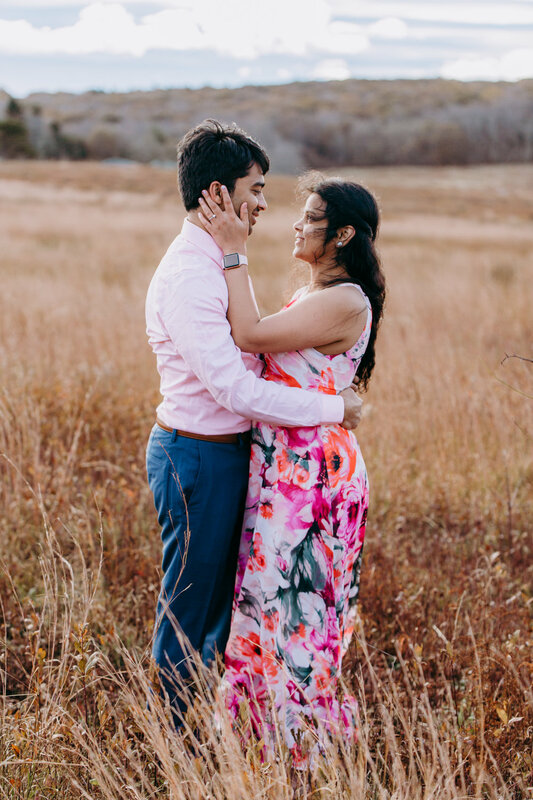 So then we got to have an awkward conversation about why they aren’t ready to get married yet. 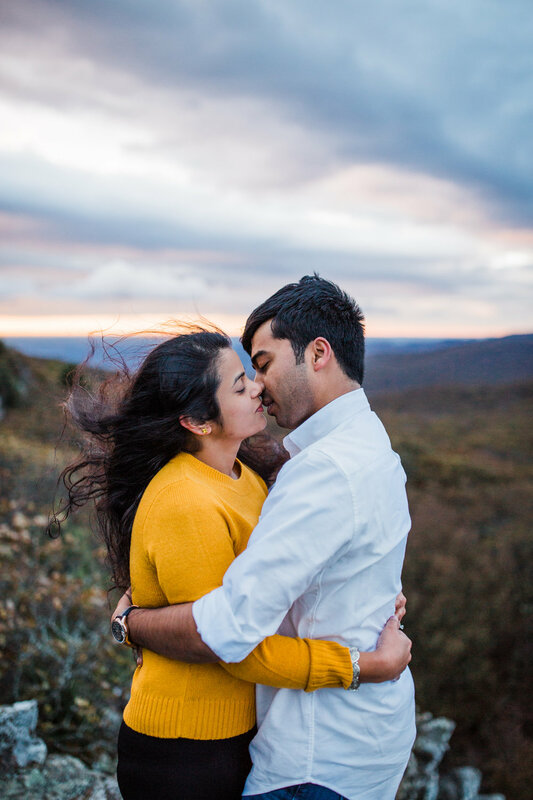 SORRY GUYS. But they were really nice about it and said they would leave when Ramesh and Mansana showed up so we could have the space to ourselves. 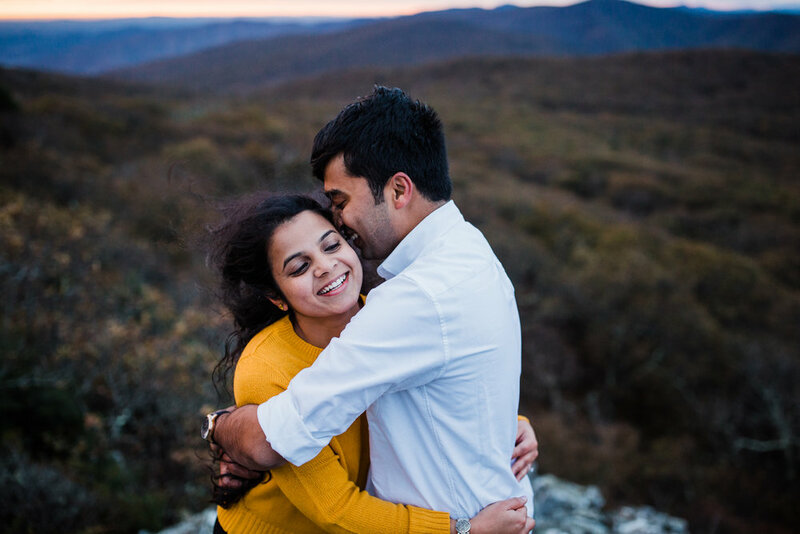 I gave the prompt for the SECOND time that morning and this time it worked! 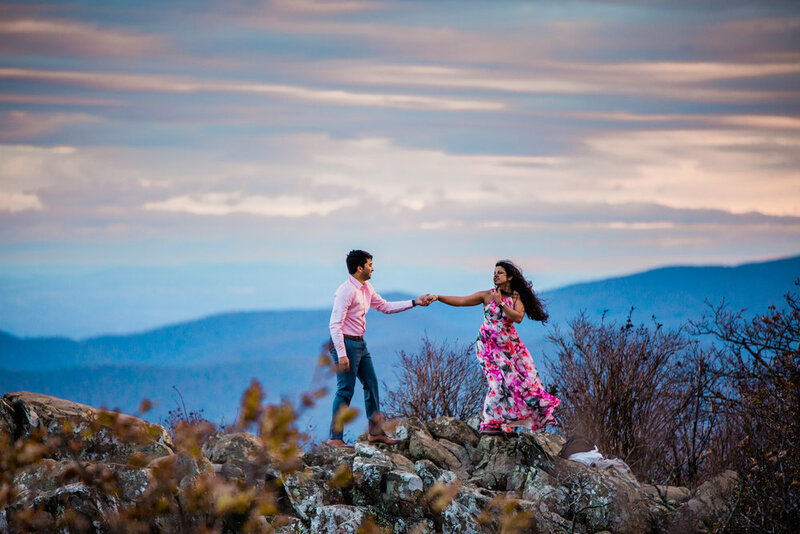 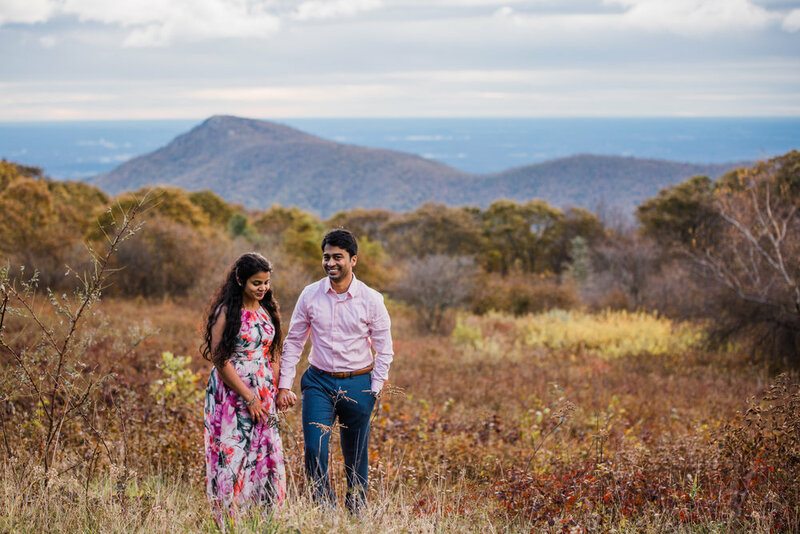 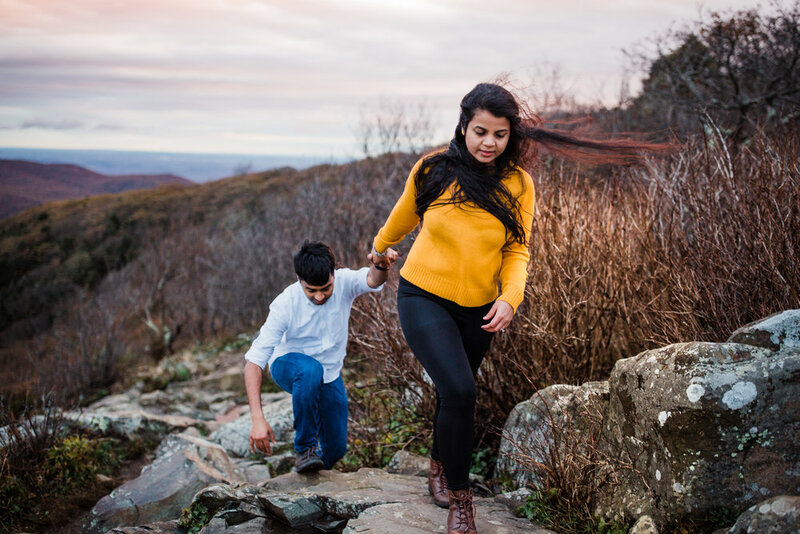 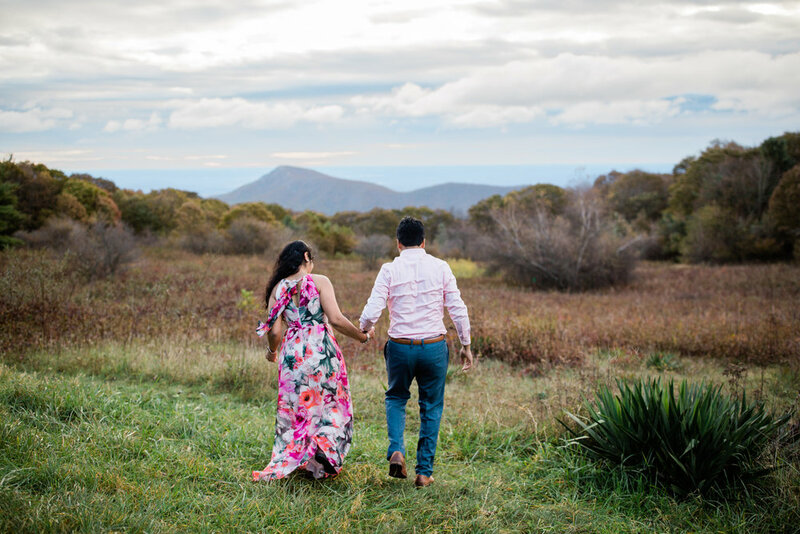 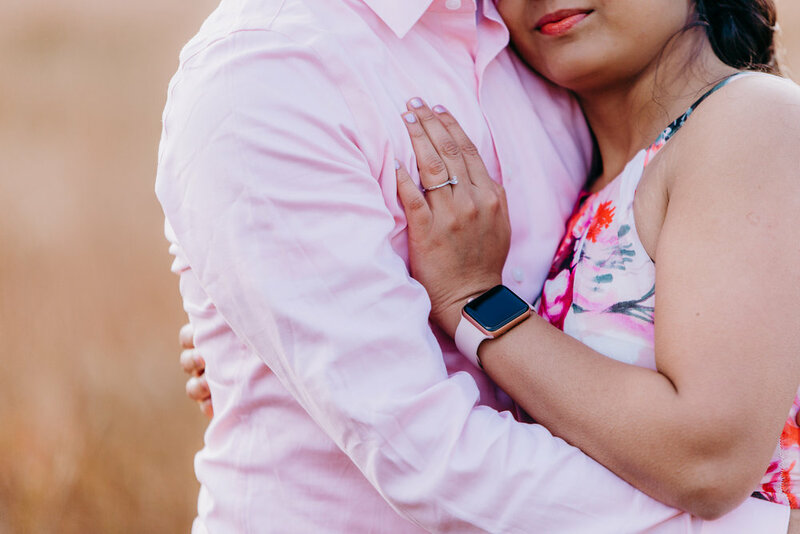 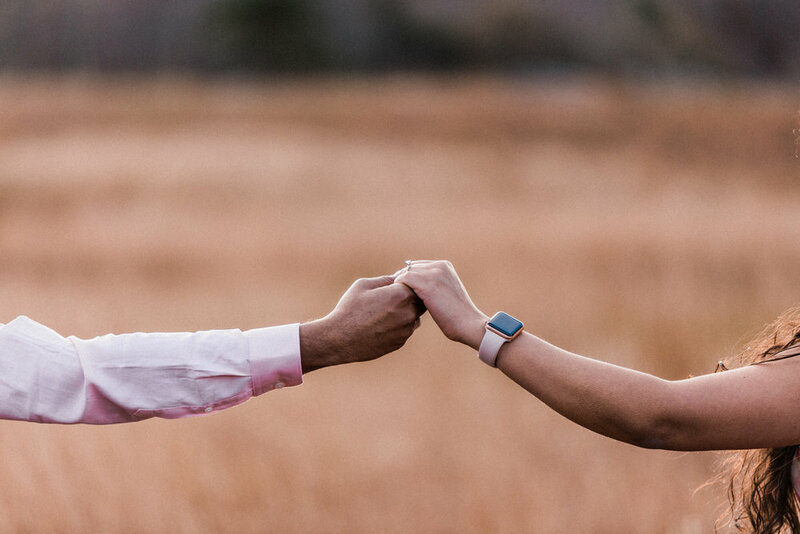 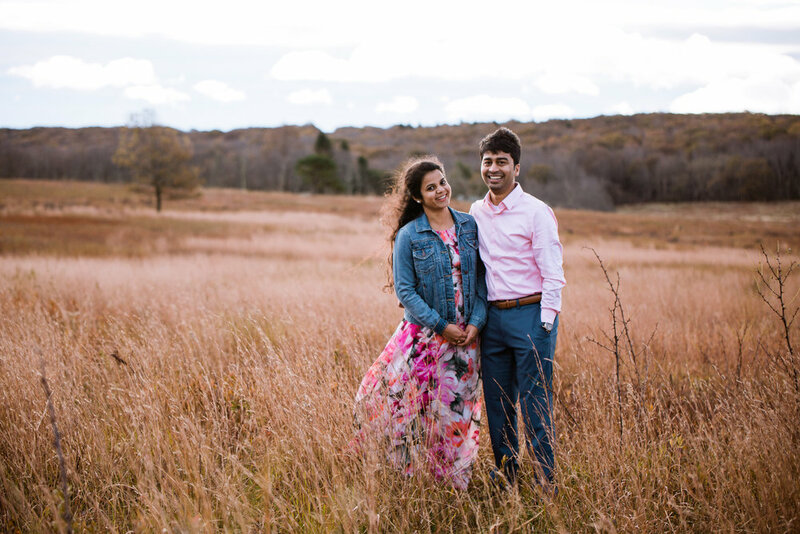 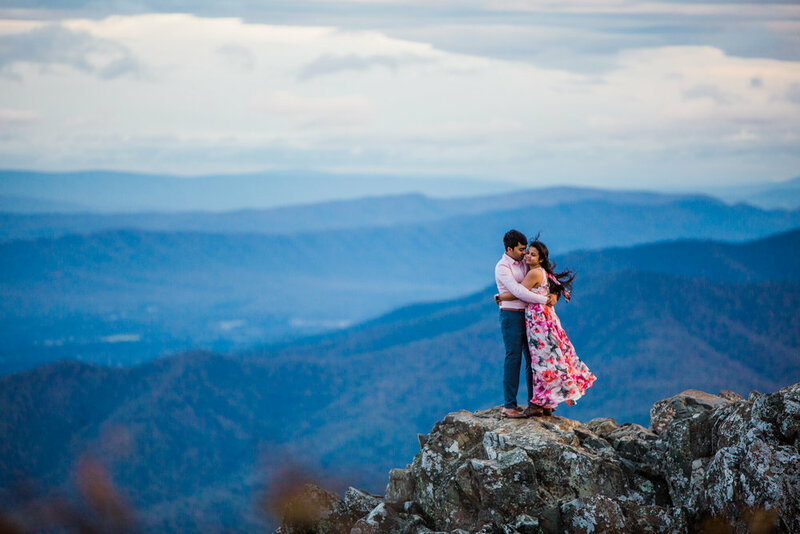 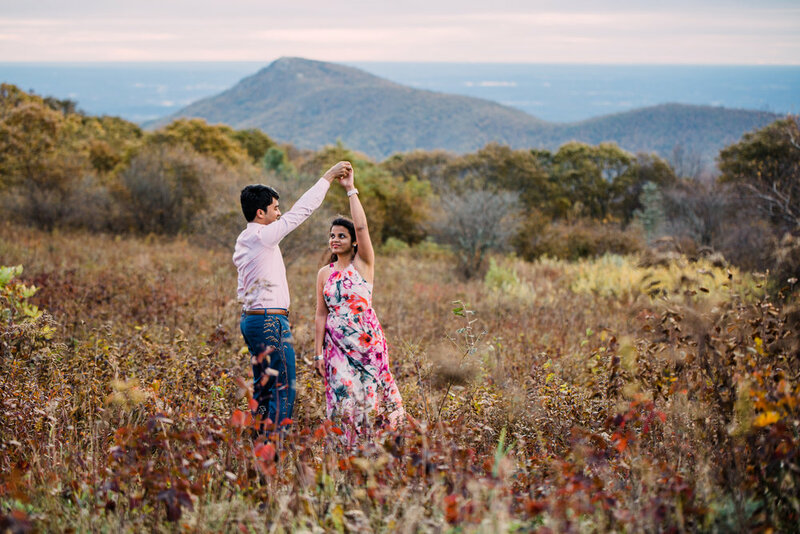 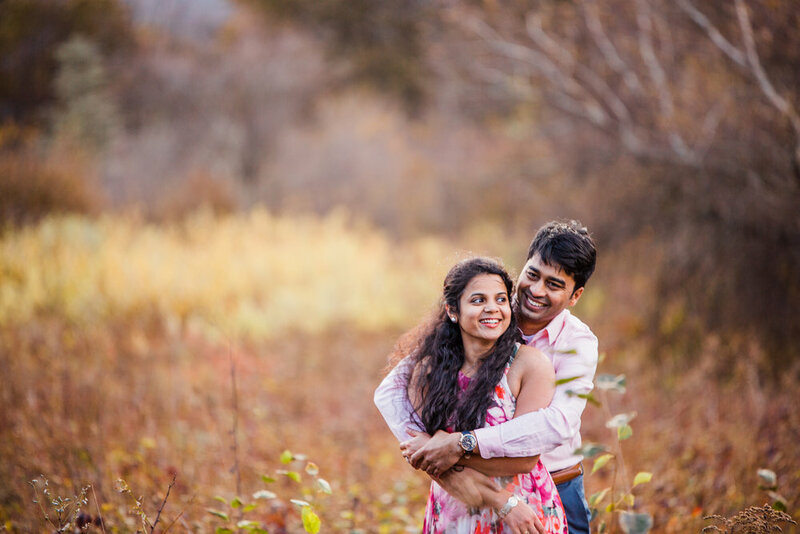 Ramesh got down on one knee, Mansana said yes, and then we tried not to freeze all of our appendages off so we could take advantage of the absolutely glorious sunrise for their engagement photos.